In this heavily Photoshopped picture you can see some of palm trees which have been added to Arroyo Parkway here in Pasadena. Arroyo Parkway begins where the Pasadena Freeway ends and has a lot of old art deco and streamline moderne architecture. The palms have been bound like this for some months. 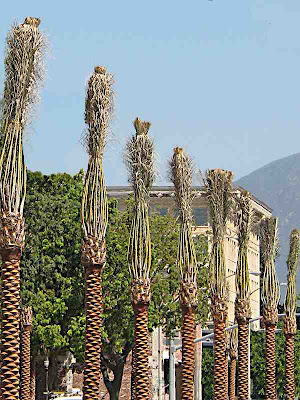 On Tuesday I walked a few blocks on Arroyo Parkway and noticed that some of the palms had finally been unfurled. There are a lot of new and very big residential units being built on this street because it is near the Gold Line. Many of them are designed in what I call the "big buildings designed to look like several different future slum dwellings" style. That's very big in Pasadena these days. 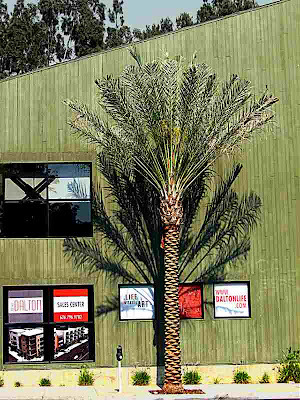 This palm tree is in front of the sales office for one of them, The Dalton. 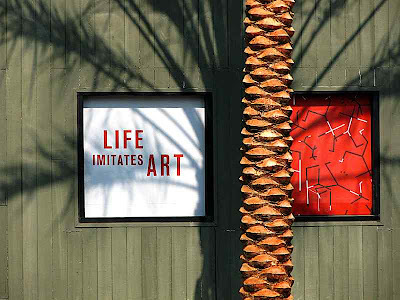 The tag line for The Dalton is "Life Imitates Art". Why would anyone want their life to imitate art? I suppose they want their lives to be Romantic or Classic or Impressionistic or Serial. Maybe there are even people who want their lives to be Mimimal. Personally I've always preferred it when Art Imitates Life. But obviously that line won't sell real estate. Here's someone complaining about the new pink and black zebra crossings on Arroyo Parkway. Here's the most information I could find about the Arroyo Project at the Pasadena city website. Click the pictures for enlargements. That's neat. I didn't know they did that to palm trees. It's always interesting to see what they do to trees to keep them shapely and beautiful. Yup, todays canned Bohemian "real estate wrap" tomorrows tear down. 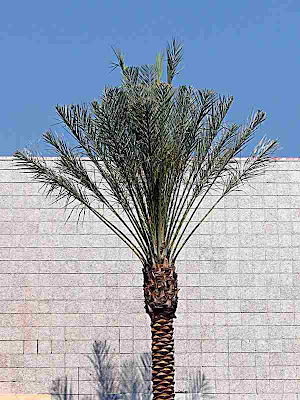 This just in: Indio wants it's Palms back. These Palms are called Phoenix Canariensis. 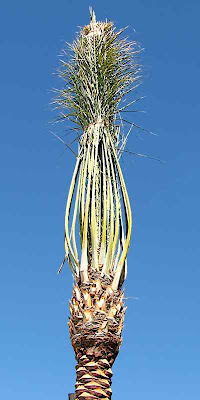 Per square foot, they are more costly then our common weed palm (Washingtonian Palm) and cheaper then the full bodied Cannery Island Date Palm. Leave them in the desert and they make dates, put them in Pasadena and they won't (mess? yes, edible dates no). I prefer them in our local deserts but they get in the way of planned communities.